Ubiquitous Mexican restaurant art | What’s up with that? Worldwide icon-chevron-right North America icon-chevron-right United States icon-chevron-right Illinois icon-chevron-right Chicago icon-chevron-right Ubiquitous Mexican restaurant art | What’s up with that? 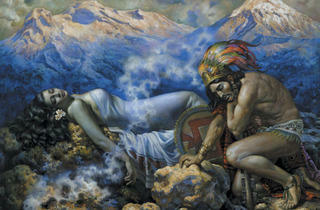 What’s the story behind that image of the Aztec warrior with the unconscious woman? In 1940, Mexican painter Jesús Helguera (1910–71) was making calendar art when he created La Leyenda de Los Volcanes (pictured). It’s based on the legend that explains the formation of a pair of volcanoes outside Mexico City, Popocatépetl and Iztaccíhuatl. 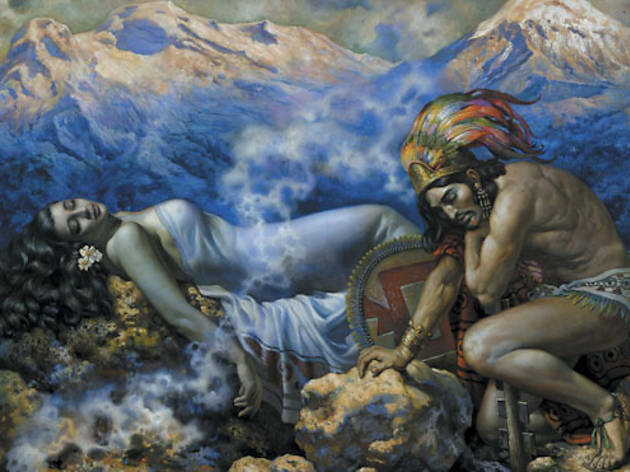 The fable brings to mind Romeo and Juliet: Iztaccíhuatl awaits the return of her Aztec warrior love Popocatépetl when she receives inaccurate news of his death. Distressed, she fatally poisons herself. He returns from battle and carries his beloved’s body to the summit of a mountain, where he watches over her eternally. Though the myth is attached to indigenous Mexico, it wasn’t spun until the mid-19th century. Independence from Spain spurred Mexicans’ interest in their pre-Columbian roots. “The Legend of the Volcanoes is one of many pseudo legends to come out of this period,” says Cesáreo Moreno, the visual arts director and chief curator of the National Museum of Mexican Art in Pilsen, which displays Helguera’s original. After World War II, Mexican immigrants brought the nationalistic calendar-art phenomenon to the U.S., displaying the images in their homes and restaurants. (In 1999, the NMMA exhibited 100 years of calendar art in “La Patria Portátil,” or “The Portable Motherland”).